Watch out Vanessa Hudgens – Zac Efron thinks that Japanese girls are “the prettiest in the world”. Zac turned on the charm as he joined a crowd of 200 lucky competition-winners to attend a screening of the Hollywood heart-throb’s latest movie, 17 Again at the Shinjuku Piccadilly theatre, in Tokyo. In a hilarious moment, Zac then converted the group into instant basketball fans. The High School Musical star asked the crowd whether they were fans of the NBA and basketball – to which the group went wild, screaming their agreement before they had even heard his question from the on-hand Japanese translator! 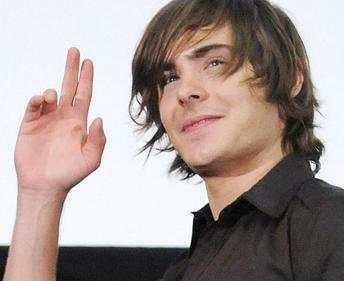 The “High School Musical” stud held an exclusive screening of the movie for two hundred lucky fans at the Shinjuku Piccadilly cinema in Tokyo, greeting the crowd with a short address beforehand. And after the screening was over, Efron waved to the massive crowd of fans that were waiting outside who weren’t lucky enough to get a ticket to the event. However, Efron’s security was forced to rush him to a waiting car as the crowd broke through barriers in an attempt to rush Zac and get his autograph.